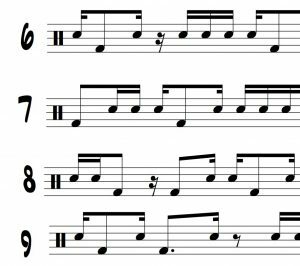 No doubt you’ve read or heard about the many ways you can use the Exercises #1 through 9 in the “Syncopation” book. These are the page long exercises that appear on pages 37 through 45. Many consider Exercises 1 through 9 to be the “meat” of the book. Most of the uses that I see discussed are based on developing jazz independence or phrasing. However, I’ve been experimenting with using these pages to develop more freedom in my funk and fusion playing. That’s where these PDFs–that I’m calling “Funk Translations”–come in. In this case, I’ve taken “Exercise 8” (page 44) and re-written each line as two-measures of sixteenth notes broken up between the snare and bass drum in 4/4. I’ve used one of the “classic” ideas for allocating the notes to snare and bass: quarter notes from the original page in “Syncopation” are assigned to the bass drum, and eighth notes are assigned to the snare drum. There are definitely other ways to allocate the notes between snare and bass, and I’ll explore those in later articles. But this method yields interesting results and can open up your groove playing. If you’ve ever wondered where Keith Carlock got some of his ideas for his groove solos, I would hazard a guess that he may have tried this idea somewhere along the way. Now I’m NOT saying this is his source; but you can see that it could lead you in that Keith-ish direction if you wished to pursue some of his playing ideas (the best and most direct way, of course, would be to transcribe some of his playing). Now, with this PDF in hand, try playing the ideas in groove form. There is no cymbal line provided, but recently I have been practicing this stuff with my right hand playing eighth notes on the hi-hat or ride. You could pick sixteenth notes for your cymbal rhythm if you wished, or you could select any partial sixteenth note rhythm. Find something that appeals to you and that you think you will use in your playing. You might be asking, “why did you start with Exercise 8?” Good question. When working with drum books, I frequently work backwards just to keep things interesting. If you’ve worked in “Syncopation,” chances are you know Exercise 1 so well that it bores you. That is the situation in my case. I can sing you the first few lines of Exercise 1 off the top of my head. So, to keep things interesting, I jumped to Exercise 8. That’s all for now. Let me know how this goes if you decide to give it a try.